Equne First Aid: Vetericyn, Cut Heal, Farnam, Corona, Banixx, Kurgo! FIRST AID-ANTISEPTIC: Wound & Infection Treatment, 16 oz. FIRST AID-ANTISEPTIC: Wound & Infection Treatment, 8 oz. FIRST AID-ANTISEPTIC: Wound & Infection Treatment, 4 oz. FIRST AID-ANTISEPTIC: Puracyn Wound & Skin Care, 8 oz. FIRST AID-ANTISEPTIC: All Animal Pink Eye Wash, 16 oz. FIRST AID-ANTISEPTIC: HydroGel Spray, 16 oz. FIRST AID-ANTISEPTIC: HydroGel Spray, 4 oz. FIRST AID-ANTISEPTIC: Utility SPRAY, 16 oz. FIRST AID-ANTISEPTIC: Utility GEL, 16 oz. FIRST AID-ANTISEPTIC: Hot Spot Antimicrobial Hydrogel All Animal 3 oz. FIRST AID-ANTISEPTIC: Hot Spot Spray 8 oz. FIRST AID-ANTISEPTIC: All Animal Wound & Skin Care 16 oz. FIRST AID-ANTISEPTIC: Animal Ophthalmic Gel 3 oz. FIRST AID-ANTISEPTIC: Theracyn Wound & Skin Care Hydrogel Equine 16 oz. FIRST AID-ANTISEPTIC: Theracyn Wound & Skin Care Spray Pet 16 oz. FIRST AID-ANTISEPTIC: Theracyn Opthalmic Gel 3 oz. FIRST AID-ANTISEPTIC: Theracyn Ear & Eye Wash 3 oz. FIRST AID-ANTISEPTIC: Antibacterial / Antifungal EQUINE Wound Lotion 8 oz. FIRST AID-ANTISEPTIC: Antibacterial / Antifungal EQUINE Wound Lotion 16 oz. FIRST AID-ANTISEPTIC: Antibacterial / Antifungal White Line Gel 8 oz. FIRST AID-ANTISEPTIC: Antibacterial / Antifungal White Line Gel 16 oz. FIRST AID-ANTISEPTIC: Antibacterial / Antifungal EQUINE All Purpose Skin Solution 32 oz. FIRST AID-ANTISEPTIC: Antibacterial / Antifungal CANINE Wound Lotion 4 oz. FIRST AID-ANTISEPTIC: Antibacterial / Antifungal CANINE 8 oz. FIRST AID-ANTISEPTIC: Antibacterial / Antifungal CANINE 16 oz. FIRST AID-ANTISEPTIC: PuriShield Wound Spray 16 oz. FIRST AID-ANTISEPTIC: PuriShield Skin Spray 16 oz. FIRST AID-ANTISEPTIC: PuriShield Hydrogel 8 oz. FIRST AID-ANTISEPTIC: PuriShield Barrier Spray 8 oz. FIRST AID-ANTISEPTIC: Aloe Heal Cream, 4 oz. FIRST AID-ANTISEPTIC: Wonder Dust, 4 oz. 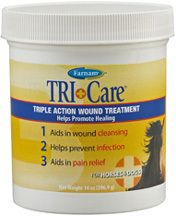 FIRST AID-ANTISEPTIC: TRI-CARE Triple Action Wound Treatment, 14 oz. FIRST AID-ANTISEPTIC: TRI-CARE Triple Action Wound Treatment, 4 oz. FIRST AID-ANTISEPTIC: Reducine Original Absorbent, 16 oz. Multi Plus Care Wound Care: Wound care without bandaging that delivers a protective barrier; minimizes the attractiveness of the wound for flies; deters licking and biting of an irritated area. Helps in most cases hair re-growth comes back in the original color. Use on minor cuts, abrasions, scrapes, and other skin irritations. Helps prevent wounds from drying out. Formulated with natural occurring disinfectants to keep wound clean. Perfect for nervous horses. Contains fish oil, raw linseed oil, spirits of turpentine, balsam of fir and sulfuric acid. The dauber enables even the most inaccessible wounded areas to be effectively covered. ORDER NOW. • Multi Plus Care Liquid Wound Care 8 oz. Dauber: ORDER NOW! • Multi Plus Care Wound Spray 4 oz. Aerosol: ORDER NOW! • Pad Heal for Dogs: Pad Heal helps check and repair injuries to dogs pads and webbing creating flexibility with remarkable, fast penetrating ingredients, while conditioning and strengthening. Water resistant as it does not wash off when dogs are in water. Pad Heal provides an outstanding protection for hunting, working or racing dogs. Incredible results for hunting, sledding, field trial, agility, rescue, racing and seeing eye dogs. 8 oz. ORDER NOW! Liquid Wound Care w/dauber 8 oz. FIRST AID-ANTISEPTIC: Pad Heal for Dogs, 8 oz. Aloe Vera Veterinary Cream: The "ORIGINAL" and revolutionary first-aid cream compounded from stabilized aloe vera. This unique skin protectant formula may be used for minor cuts and abrasions, minor burns, rope burns, skin irritations, cracked heels, and dry or chapped skin. This fine heavy cream contains: Allantoin, Vitamins E, A, D, and C, Wheat Germ Oil, and purified lanolin. 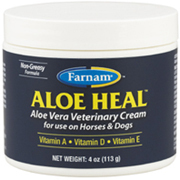 • Aloe Vera Veterinary Cream 4 oz. tube: ORDER NOW! • Aloe Vera Veterinary Cream 16 oz. Tub: ORDER NOW! • Veterinary Liniment w/ Aloe Vera: A unique and natural approach to aid in the control of temporary muscular soreness, swelling, stiffness and sprains. Horseman's Dream Liniment is carefully compounded from camphor, menthol, and eucalyptus oil in a base of stabilized aloe vera. Will not blister, stain or remove hair. Horses may be worked during treatment. 16 oz. ORDER NOW. • Corona Fung-A-Way: Fung-A-Way is an excellent topical fungicide that help in the control of several fungal infections. Helps restrain ringworm in horses, summer itch, girth itch, and other horse skin conditions. Contains Allantoin which helps protect and calm irritated skin. Non-staining formula. 32 oz. Sprayer. ORDER NOW. 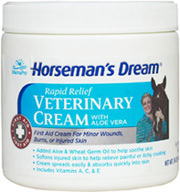 Veterinary Cream 4 oz. tubeaaaaaa Veterinary Cream: 16 oz. Corona Veterinary LinimentaaaaaaCorona Fung-A-Way 32 oz. FIRST AID-ANTISEPTIC: Aloe Vera Veterinary Cream, 16 oz. FIRST AID-ANTISEPTIC: Aloe Vera Veterinary Cream Tube, 4 oz. FIRST AID-ANTISEPTIC: Veterinary Liniment w/ Aloe Vera, 16 oz. FIRST AID-ANTISEPTIC: Corona Fung-A-Way, 32 oz. FIRST AID-ANTISEPTIC: Banixx Wound & Hoof Care, 16 oz. FIRST AID-ANTISEPTIC: Banixx Wound & Hoof Care, 32 oz. FIRST AID-ANTISEPTIC: Banixx Pet Care Spray 32 oz. • Pro-Tect Topical Skin & Wound Spray Treatment: Pro-Tect Topical Skin & Wound Spray Treatment is a deep penetrating formula, broad-spectrum antimicrobial spray for complete protection for skin and wound application. Helps destroy bacteria, yeast, mold, fungi and viruses. Conditions skin and coat to speed healing without burning or irritation. Non-flammable, non-staining with pleasant scent. CAUTION: Not for use on cats or puppies. 32 oz. Sprayer. #544646. ORDER NOW! • Pro-Tect Anti-Microbial Wound Cream: Pro-Tect Anti-Microbial Wound Cream is a deep penetrating cream base calm cuts, scrapes and abrasions for faster healing and protection. Helps destroy harmful organisms for faster healing. Contains skin conditioning emollients. CAUTION: Not for use on cats or puppies. 6 oz. #544696. ORDER NOW! FIRST AID-ANTISEPTIC: Pro-Tect Topical Skin & Wound Spray, 32 oz. FIRST AID-ANTISEPTIC: Pro-Tect Anti-Microbial Wound Cream, 6 oz. FIRST AID-ANTISEPTIC: TRIODINE-7, 16 oz. FIRST AID-ANTISEPTIC: TRIODINE-7, 32 oz. FIRST AID-ANTISEPTIC: Topical Fungicide, 16 oz. FIRST AID-ANTISEPTIC: Topical Fungicide, 32 oz. FIRST AID-ANTISEPTIC: Scarlet Oil Wound Dressing 16 oz. • FUNGASOL Ointment: Forms a protective layer over affected areas; perfect for pastern dermatitis. 13 oz. #430450. ORDER NOW! • FUNGASOL Spray: Easily and quickly applies to help treat fungal and bacterial skin conditions. 22 oz. #430430. ORDER NOW! FIRST AID-ANTISEPTIC: FUNGASOL Ointment, 13 oz. FIRST AID-ANTISEPTIC: FUNGASOL Spray 22 oz. FIRST AID-ANTISEPTIC: PROUDSOFF Proud Flesh Ointment, 3 oz. FIRST AID-ANTISEPTIC: WARTSOFF Wart Ointment, 4 oz.